Are you a free spirit, enjoying whatever thrills and adventure life throws at you? Does that mean you also suffer whatever slings and arrows fate sends your way? I think my oldest child is a bit like that. He is very flexible, and "goes with the flow". Sometimes, though, this means he looks back and realizes he didn't have the experience he wanted to have, because he let someone/something else dictate the order in which he did things, and how. Most of the time, that doesn't bother him. He lives very "in the moment." This can drive DH and me crazy. This same free-spirited approach to life also means that homework gets forgotten, and time is not set aside for practicing anything unless he is reminded. I worry about what kind of a future he will have if he does not exercise more control over the direction he is going. On the other hand, my youngest child is all about control. Things must be done in a particular order, a certain way. And while he is no happier than his brother to get new chores, or have his daily routine changed, once established he is fine. He is the child who remembers his assignments, and gets homework done in school before he even arrives home. He is the one who tries to tell his brother the right way to do things, and will call him on infractions. This child I worry about socially. I trust he will find a productive way to live his life and support himself financially. But will he be happy? Will he have trusted lifelong friends who will help him cope with those slings and arrows of outrageous fortune? I myself am more like my younger than my older son. By controlling the details, I make sure there are no unpleasant surprises coming at me. But watching my children, I would guess that my older son has mastered how to be happy and enjoy life moreso than my younger child. Sure, he gets upset by how unfair life (and parents) can be-- he is a pre-teen after all. But mostly his "go with it" attitude shrugs off frustration and inconvenience, unlike myself and his brother, who nurture these feelings, trying to figure out how prevent them from EVER happening again. I had an image of life as a roller coaster a few weeks ago. Some people ride them, and enjoy every death-defying moment. Others of us avoid them, or suffer through them with iron grips, hoping not to die today, even if we know cognitively how safe these rides are engineered to be (yes, there are very rare accidents, but we don't fear driving on the highway like we do these rides). This was at Six Flags Discovery Kingdom in Vallejo. I thought about riding this one, but chickened out at the end, heart pounding at my close escape! While mostly relieved when my nephew agreed to go on with my son, I was also disappointed, and slightly embarrassed. Sometimes I wish I could enjoy that roller coaster (and life) more, and worry less. If I figure it out, I'll try to teach my younger son too. If it helps, sometimes we do change our approaches. I was even more of a control freak as a kid than I am now. Letting go of what little I have has been tough, but it is somewhat cathartic. Kids are setting their patterns, I know, and won't change them for years and years, but it may happen. Sometimes it takes a good kick in the rear to cause change. Sometimes it just takes time. I have yet to find any predictable or teachable way to make significant change happen, though, so if you find one please share it! For me it takes a LOT of effort to live life according to life's terms. With the help of al-anon, I'm learning to do this slowly. My default is to want to control everything, so that I feel less PAIN. I'm starting to learn that pain comes in the resistance. If I accept the things I can't change, there is less pain. There may be grief or sadness for a while... but peace comes soon afterwards. Great post Jomama! And what great insight into your children. Love love love the post. And while I used to be a complete roller coaster nut, as I mellow with age I'm finding that I'm more appreciative of the security of flat earth. I think I'm finding that the rush on the way down is sure fun, but it's such a grind to work your way back up again! 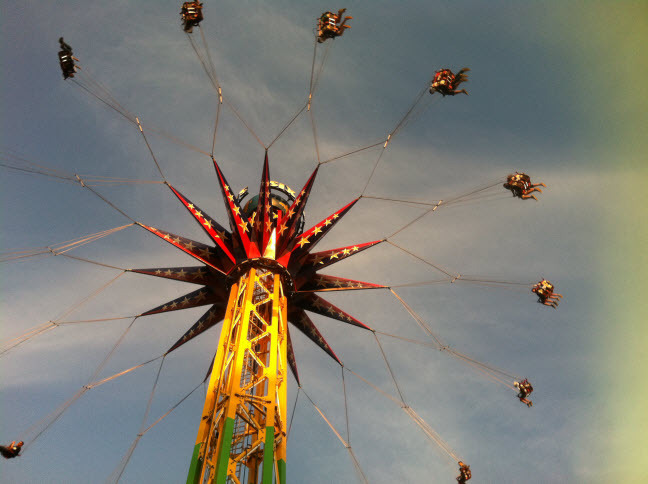 There may be a certain freedom in the ride, but there's definitely comfort in keeping your feet on terra firma. I had two like that too. My control oriented one has a PHD. My "go with the flow" lives in a basement and rides a bicycle to work at Lowes at 41.